When I first started reading this one, and the MC was working on a car in her dad's garage and LOVING it, I fell in love with this story. I am a huge lover of working on cars, and try to do it as much as possible. This book and I instantly clicked... and it only got better from there! After work at the shop one evening, Jill heads home to meet her best friend Sean at her house. When she opens the front door, everything in her world just stops. In that instant, she loses her mom, her best friend... Only to wake up in the morning with a Post It note telling her that her mom needs to go ind herself. Jill and her (WONDERFUL) dad start picking up the pieces, trying to move on with their lives. Jill and Sean start trying to talk a little again, and things seem to be going well. But on the inside, Jill is just broken. One night, sitting on the roof outside her bedroom window, Jill hears a terrible fight going on, and sees a woman throwing things at a man, hitting him. This hits too close to home for Jill, after listening to her mom and dad fight for years, so Jill throws her soda can at the house. When it accidentally breaks the window, the man comes storming out. After a rocky start, Daniel and Jill strike up a friendship. They both can talk to one another about things they can't seem to speak of to anyone else. There is one huge problem though, and that problem could ruin everything. For them both. 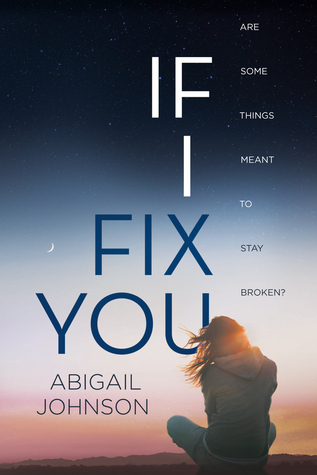 The characters in If I Fix You were so well-written. Jill's character was one of my favorites, with her love of cars, her emotions always rang true. Her deep love for her dad shone through the pages. When she gets hit with another bombshell, later in the story, her reactions were honest and emotional. Sean won me over thoroughly with his sheer determination to win Jill back. Daniel was a great guy whose emotional state led him to do some stupid things, but it was almost understandable, knowing what you learn about him. My favorite character, though, was by far Jill's dad. He was the epitome of a great father, even when he handled himself badly. His and Jill's relationship was the "something special" in this book, and I would read it all over again, just for that. If I Fix You is an emotional, beautifully written story. Abigail Johnson is dang good at drawing a reader in to a story. I loved this book, and I happily recommend it to every one of you!